Red flag with white hand and crescent. Somewhat different from the image above in details, but basically the same flag. It is questionable how much details we may ask from this kind of flag anyway. In this webpage, a photo about Anjouan flag showing reverse (or maybe main side?). Though the only substantive thing that can be said about this flag photo is that the thumb is to the hoist on the visible side of the flag, at least we have some positive info about the design of this flag: shape of the hand and crescent, and position and relative size of the emblem. On the other hand, one cannot see clarly on this photo whether there are any fingers, and the ratio seems to be 1:2. As for the Anjouan flags, yes, the red has always been darker than the French red on the flags I’ve seen (although this may change / have changed as people try to affirm the French link). A photo showing the flag of Anjouan near to the Comorian national flag shows clearly that the former’s background is plain medium red, not dark red. On Anjouan web site it seems that the hand is detached form the crescent. It’s also hard to say if the thumb is on the left or the right oriented, because we don’t know which side of the flag is represented on Anjouan website. Calvarin [clv02] shows the flag of Anjouan with the hand directly placed on the crescent. According to the constitution, the flag is charged with an open right hand. In any case, logic says it’s a right hand - it would be fairly unthinkable for an Islamic country to put a left hand on its flag! I have a photo picked from the web showing the thumb pointing to the fly. 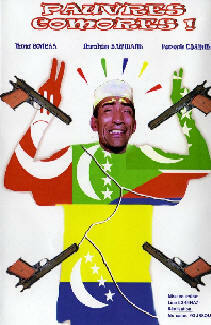 The cover picture for the film version of the 2004 play Pauvres Comores / Maskini Komori, avaliable in compact cassete tape and DVD, shows the «truculent comédien comorien Ibrahim BARWANE» clad with a ripped mantel patterned after four comorian flags: the Union (comorian national) flag, the former national flag, an unknown flag, and Anjouan flag — showing a red palm line on the white hand, implying that this flag shows the palm of a (therefore) right hand (thumb pointing to the fly). The crescent and the hand are clearly not connected also in this newer image. Why does the flag features a hand above an Islamic crescent? Surely images of the human form are banned in Islam and therefore what is it doing on an Islamic flag? Both Muslims and Jews are prohibited from depicting the human form; but even the strictest of both religions seem to make an exception for the hands. "Anjouan" comes from Swahili "Nzwani", meaning "the Hand" — thus probably explaining the flag. According to a report, the separatist movement in Anjouan adopted the name Mawana, after a sultan that once ruled the island. A short note in The Indian Ocean Newsletter (764 10.05.1997: p. 4) said that «elements of Mwawana cut down the flagpole flying the national flag and hauled up the white [?] emblem of the late sultan». As far as I know the Mawana flag (the last Sultan’s flag) is the same as the one in the constitution. The “hijacking” of the Mawana flag by the pro-French movement hasn’t met with everyone’s approval. The flag used by the Anjouani separatists was the personal standard of the last Sultan, Omar. This information was communicated in 1980 to L. Philippe [phi02a] by Said Ali Kemal, the Comorian Ambassador in France, who was the nephew of the Sultan of Anjouan and one of the sons of the Sultan of Grande Comore. Since March 1997, separatist islanders of Anjouan and the Comoros government have been clashing over the status of the island. There have been reports of demonstrations, flag hoisting (and hauling), violent clashes, deaths and arrests. The flags hoisted are the "flag of a 19th-century sultanate" and the flag of France. Reports state that the president of the Comoros promised in a television speech on Friday 1 August that Anjouan would be granted more autonomy. This was to be done by dividing the island into communes. As we have heard, however, the latest development is that a separatist president and a 13 member government has been appointed for Anjouan. On Sunday, the secessionist leader and newly appointed president Foundi Abdallah Ibrahim said: «Our demand is for separation, nothing less.» Nevertheless, Reuters reported that the demand was for separation from the Comoros and return to French rule. This would explain why they fly the tricolour. In fact, according to the Reunion newspaper Le Journal de l’Ile, participants at Sunday’s independence meeting (estimated at some 7000 people), had a picture of Jaques Chirac with the slogan «La France pour tous». The newspaper quoted a representative of the Anjouan government as saying there was two options for Anjouan: Reunification with France or independence in association with France. French officials rejected this. A second report in Le Journal de l’Ile referred to the new state as l’État d’Anjouan. The local flag is now described as red by NANDO Times (report of 6 August, based on AFP wire): «In Anjouan, where the separatists named a “government” Tuesday, the red flag of the last sultan on that island is flying above mosques and on flagpoles alongside the French tricolour.» An earlier report by Reuters also described the flag as red. The Reunion newspaper carried several pictures of the French flag hoisted in various places on Anjouan, but it had no picture of the local flag. approuvée par les Anjouanais au cours du référendum du 25 février 1998. Art. 3: L’emblème national est un drapeau rouge frappé au centre d’une main droite ouverte au-dessus d’un croissant de couleur blanche. approved by the Anjouanais [inhabitants of Anjouan] by referendum on the 25th February 1998. Article 3: The national emblem is a red flag charged in the center with an open right hand above a white crescent. Remark: is it a coincidence that this article speaks about «the national emblem» like in the French constitution? It seems then that there is just a flag and no coat of arms. It is the same flag as the old sultan flag and as the post-2002 island flag within the Comorian Union. Calvarin [clv02] shows the flag of Anjouan with the hand directly placed on the crescent � like above, but with a larger emblem. The difference in size is probably irrelevant. At www.anjouan.org, you can see the flag of Anjouan in the opening page, and in the page “phototheque”, there are several photos with flags. Interestingly enough, we can find more often the French flag then the Anjouani, and in two pictures, we can see both flags side by side. As to the frequencies of the flags, I think that it was French flag, this flag and Mawana flag, in that order, probably because the French flag is easier to come by! I didn’t see the Mawana flag much. Not much policy in evidence, although interesting as an anecdote: I arrived in Anjouan by boat from Mayotte. In Mayotte the boat (an Anjouan boat) flew the Comorien flag (the official one, green and white), as its flag of origin. Halfway over to Anjouan the Comorien flag came down and the boat sailed into Mutsamudu under the French flag (Anjouan being “French”, of course). 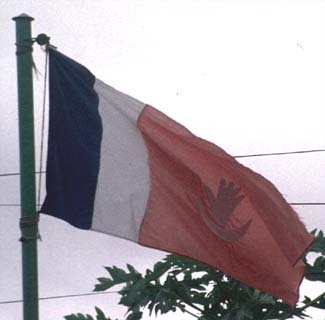 Among the flags I saw on Anjouan in April 1998 included one that was a mixture of the French and Mawana flags: basically the blue, white, red of the French flag, but with the red part slightly stretched and incorporating the white hand and crescent [see photo]. This flag was photographed at the post office in Domoni, but I also saw it in Mutsamudu. As for this flag and the French one, it wasn’t always easy to tell the difference — as I said, it was a while before I even became aware there were two different flags. But I also saw this one flying from a government building in Mutsamudu, Public Works, I think. The flag on this photo looks like a “tinkering” of a french and anjouan flag sewed together to show the aspiration of Anjouanese people to return under French administration. The hand sure looks black at first glance, but it isn’t: it’s white: This picture was taken with the light source from behind, which is quite evident if you lighten it up. The hand and crescent where either made of a patch and sewn over the red field, or printed using a thick dye (or whatever). Therefore, the light from behind doesn’t cross the symbol as it crosses the flag itself. Furthermore, the upper folding of the fly further obscures the symbol area, making it look very dark. If you lighten the whole thing up, however, you’ll see it appear white by miracle.